It is wholesome and uplifting company, especially for those on the spiritual path. Join two spiritual teacher - Sarah (owner of Serenity Reiki Clinic) and Lady Roxanna discuss spiritual issues, healing, wellness and ways to end conflict and suffering in this video series. In this video Lady Roxanna and Sarah discuss "Focus" - Perhaps you call it mindfulness? Sarah also does a mini clearing, by shifting the energy. What are the benefits of being focused? We no longer have a racing mind. We aren't distracted or preoccupied running lists. We are present and focused on living in the "now". We don't suffer as much, because we aren't worrying about the future or reliving the past. This audio was recorded live and unscripted, as part of the Satsang series. Why do we overcommit? What can you do when you realize you can't keep your word? ​ Join Sarah and Lady Roxanna in this mini talk about commitment. Gratitude allows us to celebrate the present moment. We aren’t feeling guilty over the past or worrying about the future. We are present and centered in the “now” time. You stay mindful when you acknowledge all your many blessings. It also magnifies these positive emotions and allows your body to relax and move into a receptive state. Research shows that positive emotions fade faster than feelings of worry or dread, but once we activity work on maintaining an outlook of gratitude we can shift back to positivity. ​An easy way to shift is by beginning a gratitude journal. Each day write three things you are grateful for. These can be big or small, such as the sunshine or a cozy bed to sleep in. When you have trouble shifting back to positive reread past entries and watch as even more good things flood into your life. I'm SUPER EXCITED to share these new designs with you! I hope well. We are putting the finishing touches on the latest adult coloring book Mandalas to Calm the Angry Mind this week. This book is intended to help you relax and move into a state of mindful peace as you color. These Reiki infused designs are all new and are all drawn by hand, by me actually. You will not find them in any other book or publication, because they are not "stock" images. Explore the difference in simply coloring and coloring mandalas that were drawn with intention and infused with Reiki today! PS Don't forget to pre-order today to take advantage of the PDF Bonus and savings including free shipping in the USA. If you are ordering out of country just send us a quick email and we will figure the best shipping rates for you. Are you ready for the new energy? The theme for January is "You". Its time to step into your own power and take charge of your life. Its time to believe in yourself and surrender the need to always be in control, after all, the Universe has your back...January should be a good month of positive growth and adventures, for more watch the video or book your own private reading. Can you believe it's December already? This year has just flown by! So how are you? I hope well, but I just wanted to let you know it's okay if you aren't. We are finishing out a turbulent 2017 with a Mercury Retrograde, plus the stress of the holidays and most of us are already on overload. The good news is that the Mercury energy will bring up past issues for us to work on, but of course that's the bad news too! Just remember healing isn't an overnight process. Past hurts resurface when we are ready to further heal them. But no matter what, allow yourself time to heal. Also know it's okay to feel the way you feel. Actually its quite a paradox, but when old wounds resurface and you realize that they never were fully healed, they will then begin to heal. Sometimes just the act of acknowledging these past traumas and allowing yourself to feel your feelings is enough to trigger a huge, multilevel healing. So plan on including self-care time in your schedule this month. If you want to know more about Mercury Retrograde I recorded a video class here. You can watch the 30 minute video and learn what each sign can expect in terms of lessons. Also I have a video going up shortly on Youtube, in the meantime you might want to watch the Tips for Highly Sensitive People Video for extra holiday support. Stay warm and take care of yourself. And remember you can't pour from an empty cup, so to give your best you need to take care of you too. ​I hope your week is going well! I’m happy to announce more coloring books have been added to Amazon. Find them here. Did I mention the coloring books are all one-of-a-kind? I drew every single one of these reiki infused prints, no outsourcing or recycling of images. Each book contains 30+ new drawings to help you. The reason these books came about was since 2007 I have given coloring pages to clients to relax with. Different designs will trigger different reactions; simpler, easier to color designs will help the mind relax and allow you to drift off to sleep, while more complex designs allow the brain to move into "problem solving" mode. Other designs help with anxiety and allow you to relax and calm down. Have you ordered your books yet? These designs can also be used to make foundations for crystal grids and during meditation. (Plus they are fun to color!) Let me know what you think and be sure to leave feedback on Amazon! 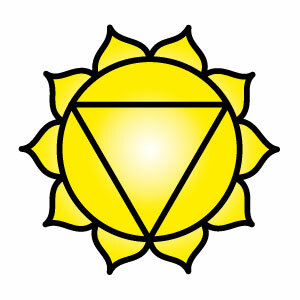 If the solar Plexus chakra is blocked, then you likely feel easily depressed and rejected and possibly wanting to blame others for your feelings. You may not have much self-confidence or self esteem. You may feel that life is happening to you, not with you. Life has little to no meaning and you may feel your just “going through the motions.” Life is joyless and becomes something that must be endured or overcome. Most people with a blocked third chakra are emotional chameleons. These people are always willing to change to suit the needs and wants of others around them, putting their needs last. This usually results in their own needs never being expressed, much less met. If this behavior continues it can lead to less than balanced or satisfying personal relationships. Most of us are taught from early childhood to repress our emotions and feelings. We must always be polite, think of others and repress what we feel for fear of hurting to angering someone else. Many of us are taught to put other people’s needs before our own. Servitude is taught or at least implied as a means to a fulfilled life. Society also teaches us that we must always be practical and wary. Always guard against people trying to take advantage of us or exploit others. We are taught that we live in a restricted society where people will often take advantage of one another. The media reinforces this ideal so this problem is very difficult to overcome. By repressing the solar chakra, you place yourself on auto-pilot and this can cause severe emotional problems. Doubt and mistrust will eventually destroy your vitality if this continues. You may miss out on life experiences because of this blockage and find yourself becoming bitter or resentful of others. If you want to work further on these and other third Chakra issues, read about the intensive 5 Week Chakra Course here or if you just wish to work more on finding your own way or your life's purpose then join me for a 30 day “Living Life with Purpose” challenge in November. The price is $39.99 but it is on offer until September 20 for only $31.00. Sign up today to get this great price. Why is living a purposeful life import? When you decide on your life’s purpose, it gives what you do a lot of meaning. Every step along the way, and all the work you do towards reaching your goals, serves to bring you one step closer. It becomes much easier to get things done, when they are done with purpose and with a firm goal in mind. Life then flows and joy can return. To learn more and discover your life’s purpose join me for a 30 day challenge. Do you ever feel like you’re just "going through the motions" in life? Are you tired of feeling tired all the time? Or like you’ve become a passenger in your own life, being swept away by some unseen current? Do you no longer feel like you are in charge of your own life? Did you know "off balance" or blocked chakras can cause mental as well has physical maladies? Literally leaving you feeling burned out, anxious, fearful, apathetic or lost? Or that a few simple changes can make a huge impact on your wellbeing and ignite your love of life again? But let me clarify this - I’m talking about REAL, LONG LASTING CHANGE, not temporary fixes or the same repeated advice you see copied and pasted over and over on line; but real information that is key to true, lifelong change. So if you are feeling empty, frustrated or generally like something is missing in your life or if you have studied the chakras and know has be more to it, then don’t miss this new course! In the newest Chakra Master Course we will begin an in-depth five (5) week immersion of the wisdom of chakras and of balancing the third chakra to restore harmony to your life. During this course we will analyze and overhaul this ancient power center. Working together we will examine and repair life long damage, as we learn affective ways to reignite your passion for life. The third chakra governs issues of willpower, ambition, self and action. It is the seat of our ego and is responsible for our ability to achieve goals. This energy center is weakened by all forms of shame, embarrassment and self-consciousness. Our mental clarity, as well as the ability to learn new things or have new adventures/experiences are also part of this powerful energy centers functions. Suffer from panic attacks? Bouts of bitterness, anger, rage, apathy or find yourself constantly overindulging in things? These are also indications of third chakra impairments and can be addressed and rebalanced. Did you know anxiety and low self-esteem often accompany an under-active Solar Plexus Chakra? And if we let these emotions fester, it can and will affect our other chakras, and by extension, our physical and emotional states? This often overlooked powerhouse can have a long lasting affect on our mental and physical health. Physically, it supports your liver, pancreas, gallbladder, stomach and spleen. So it has a HUGE impact on how we experience life and the quality of life we live. Really, all of your chakras work together to bring about a state of health and vitality. Thats why I have developed these Master Chakra Classes. Because balancing your entire chakra system will help to resolve blockages or imbalances in any one chakra and give you back the life you deserve! For more information on the next course or to read about past classes click here and be on the look out here (Serenity’s Youtube Channel) for videos on the chakras with tips and techniques you can use to get these powerful energy center back in balance.